Over the years, CPU and graphics card speeds have been increasing at a dramatic rate. In order to generate the new speeds, CPUs have more transistors, are drawing more power and have higher clock rates. This leads to greater heat produced within the computer. Heat sinks have been added to all modern PC processors to help try to alleviate some of the heat by moving to into the surrounding environment, but as the fans get louder and larger new solutions are being looked into, namely liquid cooling. Liquid cooling is essentially a radiator for the processors inside of the computer. Just like a radiator for a car, a liquid cooling system circulates a liquid through a heat sink attached to the processor. As the liquid passes through the heat sink, heat is transferred from the hot processor to the cooler liquid. The hot liquid then moves out to a radiator at the back of the case and transfers the heat to the ambient air outside of the case. The cooled liquid then travels back through the system to the components to continue the process. What Advantage Does This Bring to Cooling a System? Liquid cooling is a much more efficient system at drawing heat away from the processor and outside of the system. This allows for higher speeds in the processor as the ambient temperatures of the CPU or graphics core are still within the manufacturer's specifications. This is the prime reason why extreme overclockers tend to favor the use of liquid cooling solutions. Some people have been able to almost double the processor speed by using very complex liquid cooling solutions. The other benefit of liquid cooling is the reduction of noise within the computer. Most current heatsink and fan combinations tend to generate a lot of noise because the fans need to circulate a large volume of air over the processors and through the system. Many high-performance CPUs require fan speeds in excess of 5000 rpm that can generate very audible noise. Overclocking a CPU requires even more airflow over the CPU, but when a liquid cooling solution there is generally not as high speed required for the fans. Generally, there are two moving parts to a liquid cooling system. The first is the impeller which is a fan immersed in the liquid to circulate the liquid through the system. These are generally fairly low in noise because the liquid acts as a noise insulator. The second is a fan at the exterior of the case to help pull air over the cooling tubes of the radiator. Both of these don't need to run at very high speeds which reduces the amount of noise by the system. What Disadvantages Are There to Using a Liquid Cooling System? Liquid cooling kits require a fair amount of space within the computer case to work effectively. In order for the system to work properly, there must be space for items such as the impeller, the fluid reservoir, the tubing, fan and power supplies. This has a tendency to require larger desktop system cases to fit all of these parts within the computer case itself. It is possible to have much of the system outside of the case, but then it would take up space in or around the desktop. Newer closed-loop technologies have improved the space requirements by reducing the overall footprint. They still have specific size requirements in order for them to fit into a desktop computer case. Specifically, they need enough clearance for the radiator to replace one of the internal case fans. Second, the tubes for the cooling system needs to be able to reach from the component that needs to be cooled to the radiator. Be sure to check your case for clearance before purchasing a closed loop liquid cooling solution. Finally, a closed loop system will only cool a single component meaning if you want to liquid cool a CPU and a video card, you need space for two systems. Custom built liquid cooling still requires a significant level of technical knowledge to install. While there are kits to purchase from some of the cooling manufacturers out there, they still need to be custom installed into the PC case. Each case has a different layout so the tubes must be cut and routed specifically to make use of the room within the system. Also, if the system is not properly installed, leaks could cause severe damage to the components inside of the system. There is also the possibility of damage to specific parts of the system if they are not attached properly. Is Liquid Cooling Worth the Trouble? With the introduction of closed-loop liquid cooling systems that require no maintenance, it is very easy to generally install one into a desktop computer system. Closed loop systems may not offer the performance as a custom built system with larger liquid reserves and larger radiators but there is almost no risk. The closed loop systems still do offer some performance benefits over traditional CPU heatsinks including larger horizontal tower heatsinks but can still fit in smaller cases. Air cooling is still the most prominent form of cooling due to the ease and costs of implementing them. 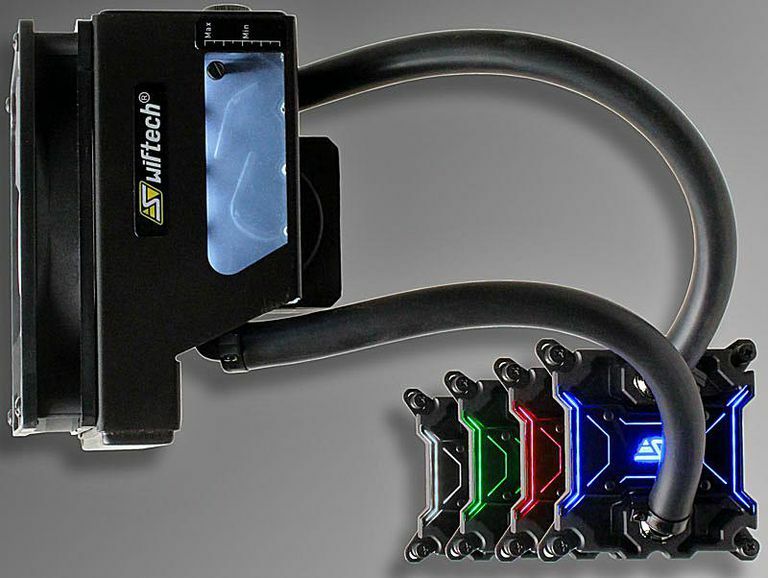 As systems continue to get smaller and the demands for high-performance systems increase, liquid cooling solutions are going to become more common in desktop computer systems. Some companies are even looking into the possibility of using liquid cooling options for some high-performance laptop computer systems. Still, liquid cooling is going to be found only in the most extreme of performance systems and custom built by users or high-end PC builders.